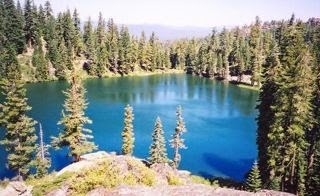 THPBlog: Sierra Pacific Industries to log near several high elevation lakes south of Westwood, CA. Sierra Pacific Industries to log near several high elevation lakes south of Westwood, CA. This THP is about 3 miles south of Westwood, CA near Mountain Meadows Reservoir and close to Deerheart Lake, Hidden Lake, and Homer Lake which are popular hiking and fishing destinations. By the way, the THP name "Vargtimmen" is of Swedish language origin and means "hour of the wolf", a fitting name for an SPI THP. Sierra Pacific Industries is planning a tractor based logging operation in white fir, Douglas fir, red fir, sugar pine, incense cedar and ponderosa pine forests at an elevation of 5,160 to 6,440 feet. 6,000 feet of seasonal road is planned, and 6 road drainage sites are proposed for work including rocking, dip construction and culvert maintenance. SPI wants to use a haul road inside a class I watercourse (year round), and a landing inside a class III (intermittent) watercourse. There are 2 osprey nests within 2.0 mi and 2.2 mi of the THP area, 2 bald eagle nests within .8 mi and 1.2 mi of the THP area, a willow flycatcher was seen within .4 mi of the THP area, and 2 peregrine falcons were spotted within .7 mi of the THP area. Several CA spotted owl nesting territories are located within 400 feet of logging units. More information is available on the THP Tracking Center website.